"As academics we acknowledge that all of our scholarly work takes place within larger social contexts – particularly in institutions committed to social transformation. South African institutions are under an obligation to revisit relationships forged during the apartheid era with other institutions that turned a blind eye to racial oppression in the name of 'purely scholarly' or 'scientific work'." Israeli universities are not being targeted for boycott because of their ethnic or religious identity, but because of their complicity in the Israeli system of apartheid. As the academics who have supported the call clearly articulate in their statement, Ben-Gurion University maintains material links to the military occupation. Israel's attacks on Gaza in 2009, which saw the killing of more than 400 children, drew immediate and widespread international condemnation. Israel's violation of international law was further confirmed by South Africa's Justice Richard Goldstone in his report to the United Nations. Ben-Gurion University directly and indirectly supported these attacks, through the offering of scholarships and extra tuition to students who served in active combat units and by providing special grants to students who went on reserve duty for each day of service. The principled position of academics in South Africa to distance themselves from institutions that support the occupation is a reflection of the advances already made in exposing that the Israeli regime is guilty of an illegal and immoral colonial project. South Africa's Human Sciences Research Council, in a response to an investigation commissioned by the South African government in 2009, issued a report confirming that the everyday structural racism and oppression imposed by Israel constitutes a regime of apartheid and settler colonialism similar to the one that shaped our lives in South Africa. More recently, the international response to the shameful attack on the flotilla carrying medical supplies and other basic goods to the ghettoised population of Gaza was a sign of the erosion of Israel's legitimacy in the eyes of the international community. In South Africa, the recall of our ambassador to Israel and the issuing of one of the strongest forms of diplomatic condemnation, the démarche, to Israel's ambassador in Pretoria was a strong statement of recognition by the South African government that Israel's actions deserve our utmost contempt. The campaign for boycott, divestment and sanctions against Israel has now launched in South Africa. Trade unions in South Africa have publicly committed their support; most notably with the action by South African Transport and Allied Workers Union dockworkers early last year to refuse offloading Israeli goods at Durban harbour – a commitment that was renewed in July this year. 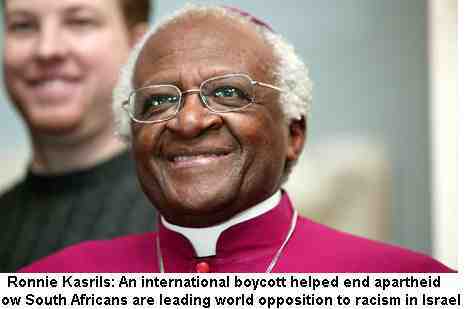 The boycott and sanctions campaign ultimately helped liberate both black and white South Africans. Palestinians and Israelis will similarly benefit from this international non-violent campaign – a campaign that all South Africans can take forward. 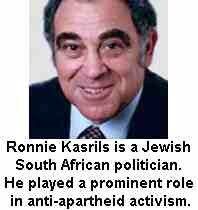 There is no equivalent of South African Apartheid existing in Israel. The so-called "occupation" is called such as a result of the long standing war of attrition the Arab states have waged against Israel from before the existence of the State. Why an intelligent Jewish man would hold such stupid opinions about the Jewish State is beyond my comprehension. Unfortunately there is an equivalent. It is called Jewish towns, 93% of land which Arabs can't access, a lack of an Israeli nationality so the State isn't the state of its own people, the differential welfare benefits and use of army service to give preference in different areas, the lack of 'return' for Palestinian refugees, the physical attacks by Israeli gangs on Arabs, the calls not to rent to Arabs. I could go on. As I said there are, as of yet, no signs saying 'No dogs or Arabs' but everything is already segregated in reality. Just 4 secondary schools are mixed for example. Half the Arab villages are 'unrecognised'. Al Arakhib has been demolished for the 8th time to help in the 'Judaisation' of the Negev. The occupation isn't 'so-called' to those living under it and your blindness to that fact renders the rest of what you write completely void. Before 1967 Nasser made a no. of attempts to reach a settlement with Israel and was brushed off. It wasn't Nasser who attacked in 1956 was it? Israel has always preferred the threat of war in order to justify its role in the Middle East and its sponsorship and subsidies from the USA. That is what it desired, as Haaretz in a famous 1953 editorial argued, to become the West's strategic ally and watchdog in the region. So enough of your simplicities Joel and try looking beyond the propaganda rhetoric. Tony, know any white landowners that have lost their businesses lately? Things aren't really much better in SA now that the tables are turned. Much of what you say is true, but why should palestineans receive their land back when all the jews that got kicked out of arab countries get nothing? I'm afraid I don't know many landowners full stop. Let alone white South African ones! The whole point is that the Jews weren't kicked out of the Arab countries. They left as this review by Avi Shlaim http://azvsas.blogspot.com/2010/12/review-avi-shlaim-slates-martin.html shows. Their position was destabilised by Israel unsurprisingly. It called itself a Jewish state, said that it was the State of the Jewish people, expelled 3/4 million Palestinians and expected no reaction to Jews in Arab countries? You must be kidding. Look at the US reaction to the Japanese during the war? Despite this they weren't kicked out but their lives were made very difficult and so the oldest Jewish community in the world, in Iraq (Babylon) virtually came to an end. It's tragic but that is Zionism. And because not enough went quickly enough they went and planted a few bombs to help things along. This is indeed Zionism.